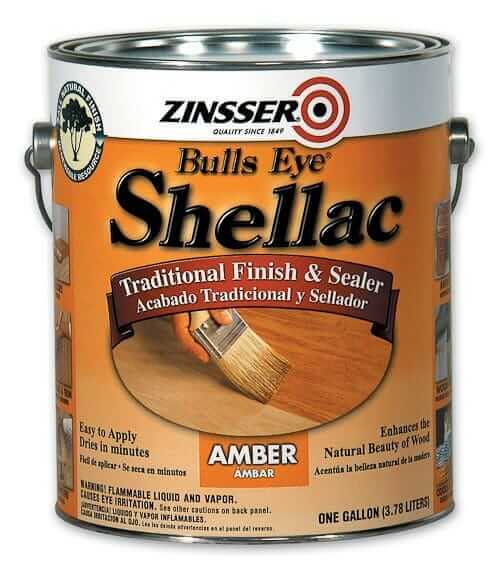 Also, if you choose to paint & get that cottage-y look…you might want to try chalk paint where you don’t have to prime first…you can search on the net how to make your own (mixing paint with plaster of paris) instead of buying the very expensive stuff that come in limited colors. I LOVE the green inserts on the hutch! I’d work in some avocado green in the rug and lose the blue. I also agree with a table runner, or some placemats on the table to break up all the wood. 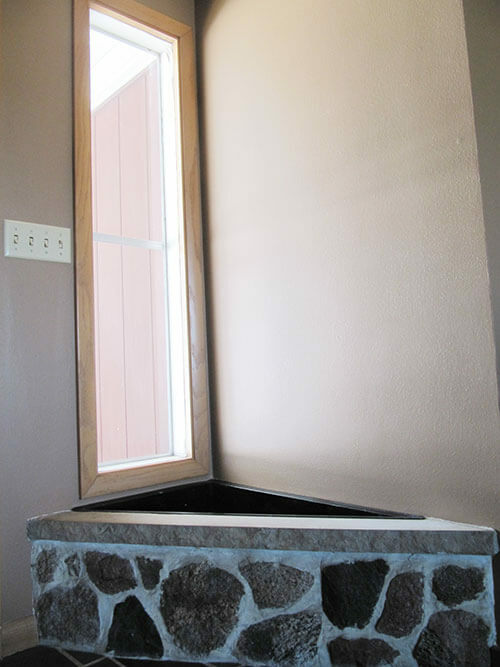 The wall above the surface of the hutch – FLAIR SQUARES!! *lol* Sorry – couldn’t resist. I’d tile that area I think. 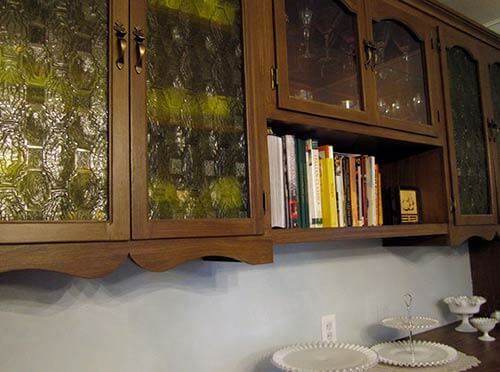 I also agree with darkening the wood of the hutch to match your table. I’m a little taken aback by how many people on RETRO RENOVATION are encouraging Kami to REPLACE the fabulous green inserts. Those are what make the hutch. 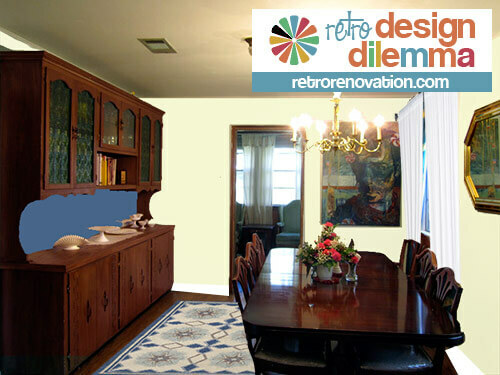 I would be more inclined to “gently” replace the dining room table, which is less unique, but, as Pam said, I applaud Kami for trying to keep the furniture that has history with the house (whether the elderly couple were designers or not), not to mention the financial savings. One of the best ideas here, in my opinion, is painting the hutch to make it appear as a built-in that’s been there all along…if you’re really determined to add “cottage” in there. 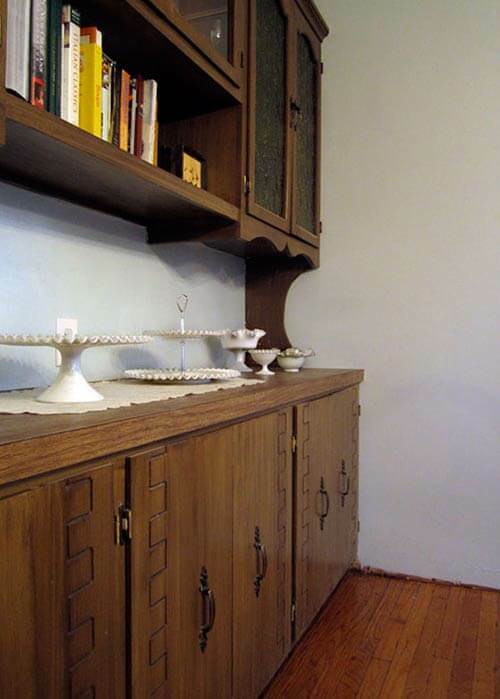 Or, alternatively, I, too, agree with darkening the wood of the hutch to match your table. 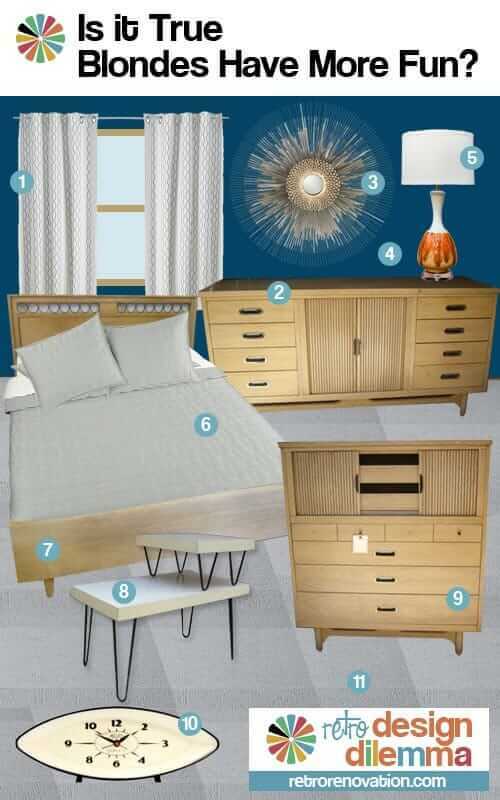 I also stuck to ’50s-’60s in decor, but I recently fell in love with Z Gallerie “apple green” curtain panels. When looking for a paint color to complement them, a designer friend recommended I go and get the paint matched to the curtains — turns out my “apple green” panels EXACTLY match Benjamin Moore’s “Avocado”! You can’t get more ’70s than that. So now I’ve embraced the ’70s…and loving it! I love that you’re embracing it, too. Good luck! Exactly. My mother’s [very expensive custom cherry] 70’s kitchen cabinets had those inserts. The “realtor” encouraged me to paint the cabinets and replace the panels when selling the $600K house (in 1998). ! Um, NO WAY. As it turns out, the very first buyer who I had (after firing the realtor) bought the house and loved the kitchen. 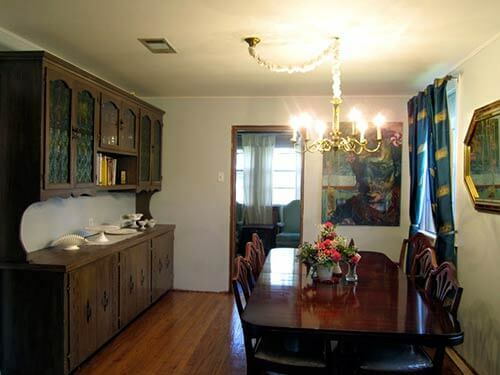 I say either boldly embrace the Mediterranean era and leave the china cabinet alone or if it’s is smudgy and “used” looking,(which it doesn’t seem to be)… go with painting it a period color like avocado. But it will NEVER look “right”. OR just sell the whole thing because you can get “cottage” very inexpensively but it won’t be that massive heavy build you own now unless it’s original not a reproduction. No offense but all of the book and colonial style glass knickknacks should be put away and replaced by Mediterranean period LARGE pieces like a giant orange glass bowl, maybe a turquoise decanter and multicolor glasses etc. Maybe a period rug like plushy red or orange. Replace the chandelier with something period. I would seal the deal with a huge almost campy Mediterranean piece of art or even a “velvet Elvis” type of piece with a Flamenco dancer or something. When I gave a perfectly good plaid sofa to a college kid once, she complained “I hate plaid and I hate green”. My answer was “Nobody knows you hate it so do it WELL and make it work.” I’d say the same thing applies here. You have a charming gift from a the former owner to tell a story about how you came to own a 1970’s Mediterranean dining room LOL.. I can’t tell about the table but it looks like cherry to me and the china cabinet? Is that a fruitwood or what? The mismatch of table/chairs (Queen Anne?) 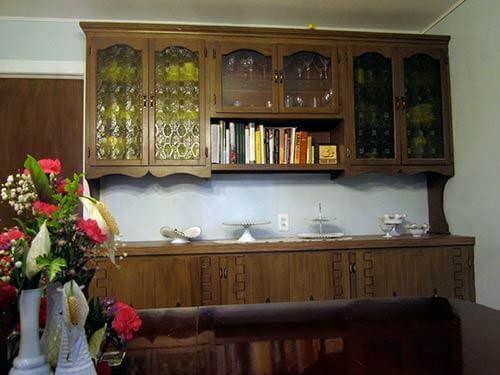 and china cabinet is more disruptive to me than the 70’s Mediterranean so I don’t know about that. Maybe cover the seats in a 70’s crushed velvet retro fabric. No offense but I don’t like the pattern rug AT ALL. Whoops I just reread the piece is laminate and peeling. Major major project IMO. Especially with all the cutouts on the door. If it can be sanded down without damage you can apply that antiquing painting technique that comes out looking like distressed whitewashed or even in avocado …I remember they used to sell the kits and you applied the green and “antiqued” it with black that you wiped off. 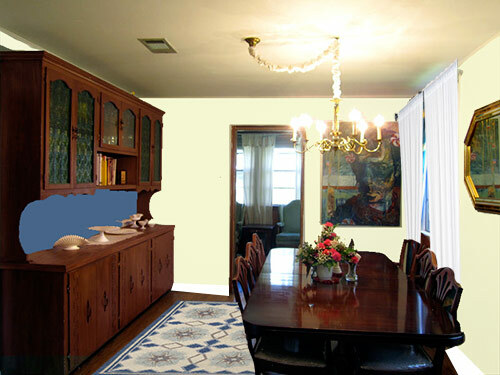 And you have a Mediterranean antiqued painted china cabinet. I would use a color if you’re going to keep the table as it is unless you want cottage-y it would be cream with a tan/brown “antique” finish and replace the inserts. I would prime. the glassware that went with the Franciscan dishes was popular too. I think a mix and match look can be great, don’t let all these opinions scare you off from using what your have and making it all look fabulous! Downsizing baby boomers are cleaning out the china cabinets filled with 70’s stuff now and maybe you can find just the right lovelies for your cabinet.